When you shave, you’re dragging a razor-sharp piece of steel over your face several times over. This can do a real number on your skin if you’re not careful. However, there’s a product specifically designed to help your skin recover: after shave. Everyone has different skin, and different after shaves are designed for different skin types. So, you’ll probably have to try a few before you find one that suits your face. Below is a detailed comparison chart of the top choices on the market today. We will get to some of the choices for the best aftershave in just a minute, but first we want to tell you a bit about the history of aftershave. Men began using aftershave as a way to keep infections at bay, especially since these were the days of showering way less often than we do today. Another reason aftershave became common use was due to the razors that were used and their rather dull nature. The razors of yester year would often inflict nicks and cuts on their victims and as we are sure you can imagine, infection rates were pretty high. A single nick from a razor could result in a one way ticket to the graveyard in those days, so we can see why they thought a splash of aftershave would keep the Grim Reaper at bay. As time went on and bathing standards improved (well at least by a little bit) so did the demand for men to have a clean shaven face. This increased the need for an antiseptic aftershave to be used after each shave. Barbers of this time wanted their customers to be happy and more importantly infection free, so they began to search for a solution. During Roman times, the barbers experimented with different types of plaster that would act as a skin soother and aftershave. The way the plaster was interesting to say the very least and makes us glad that we weren’t around in the toga days. Roman barbers used spider webs that were soaked in oil and vinegar to make the plaster. The vinegar served as a means to kill any bacteria on the skin or in cuts and the oil was supposed to moisturize the skin. Adding spiders and soothing into the same sentence really seems like an oxymoron to us, though. Jumping ahead to Victorian times when the grooming habits of men really became important. Shaving soaps and cherry laurel water were used by those that could afford them, but there was still a demand for a product that would serve all demographics. This is about the time that men started to eye their female companion’s perfumes and consider using them in a new form of aftershave. Hungary was actually the first country to jump on the concept of combining men’s scents, lotion textures and aromatic waters. Never one to miss party, other European countries soon joined in. By 1770 the use of aftershave was pretty standard practice and was even taught as a “best practice” among barbers. Of course by 1770 shaving equipment had improved as had bathing practices and in addition better shaving techniques were devised. Aftershave was still used as a means to reduce infection, but it also became important to be a nice smelling man too. Aftershave is comprised of three main things and the recipe hasn’t changed a whole lot over the years with the exception of the use of more natural ingredients at times. First, we have an antiseptic that is usually in the form of stearate citrate, denature alcohol or isorpropyl alcohol. Next, we have oil to moisturize the skin. Olive oil is most commonly used now because it also helps to nourish the skin. Lastly, every girl is crazy about a nice smelling man and the added perfume to an aftershave completes the trifecta. There you have it, guys! As you can see, aftershave has really come a long way and there are tons to choose from these days. Still, we wanted to help you narrow down the list, so we compiled some information about some of our favorite products. What’s the best aftershave for men? Let’s find out. The most important thing about using an aftershave is to prepare your face to be treated. With proper preparation, you can significantly increase the restoration effect provided by your aftershave. Everyone’s process will vary, but here is a process we think works well. After your shave, rinse with warm water. Rinsing your face with warm water removes all the visible soap, of course, but it also cleans soap particles out of your pores, which can reduce irritation. Dry with a towel. Drying with a towel removes particles contained in the water you rinsed your face with and gives you face a few seconds to rest. Rinse with cold water. Rinsing with cold water tightens your skin and closes your pores. Cold water reduces inflammation, which is basically what skin irritation is. It’s like putting an ice pack on a swollen ankle. Apply your favorite after shave. When you apply your after shave, work it in to your skin gently, by rubbing your fingers in slow circles. Let it sit for a minute while you clean up your shaving area. Apply a moisturizer or aftershave balm. This step is optional, but it’s a good thing to do for most guys, especially those whose skin tends to dry out after shaving. However, if you plan on washing your face later in the day, you may want to wait to moisturize until then, sense your face will be considerably drier. Any of these aftershaves will be a good investment. Just make sure you get one that suits your skin. If you have oily skin, for example, you don’t want to buy an aftershave with too much glycerine. All of these are available on Amazon, so you can see prices by clicking on the title or picture. 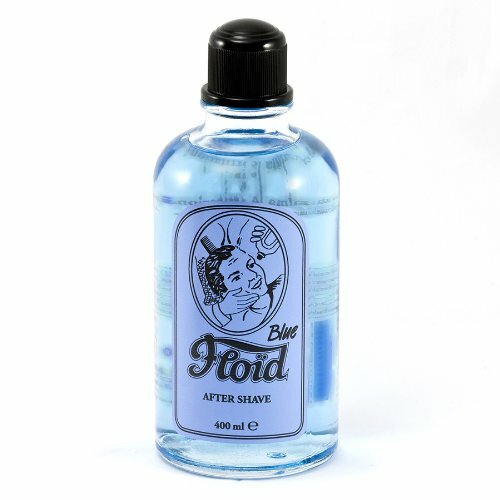 Floid Blue is a mid-range aftershave with a nice, traditional, scent. It’s a slightly powdery smell reminiscent of old barber shops. Some describe the scent as leathery and fresh. It really is a throwback. The packaging adds to this effect: a clear glass battle with a dark cap and old school printed label. There’s nothing fancy here – just tradition. Although Floids says their aftershave is “lightly mentholated,” we found it to be much more prevalent than we expected, so you can expect it to be very cooling, although it has a lower alcohol content that most other aftershaves. The enhanced cooling effect and fresh scent makes this a good aftershave for summer nights. 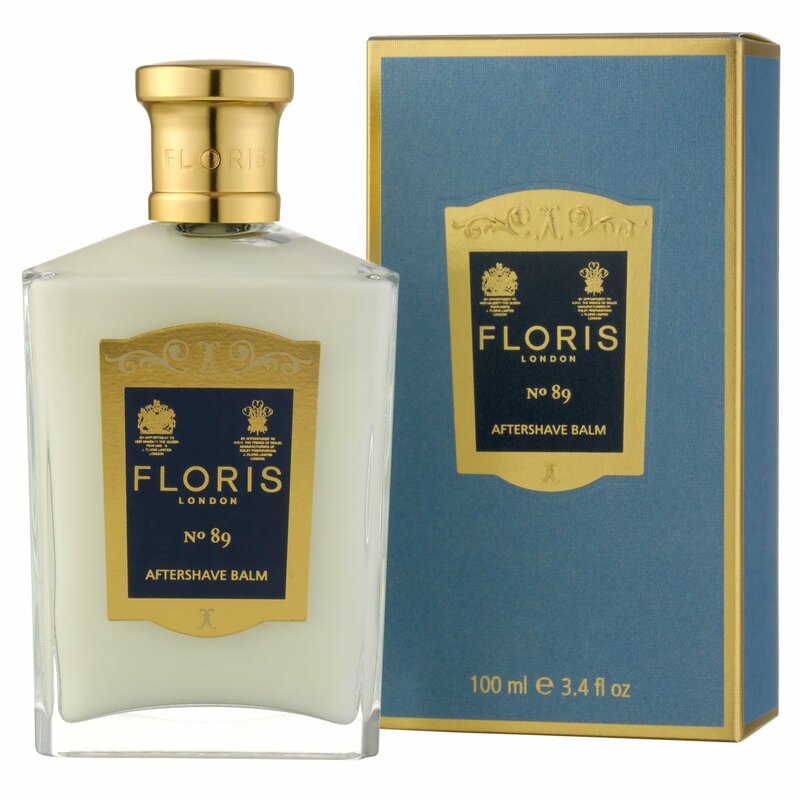 Floris After Shave Balm is a premium product, and the price tag shows it. However, this aftershave is absolutely exceptional in every way. This aftershave was worn by James Bond in the Ian Flemming novels. This is a rather heavy aftershave that does an excellent job of moisturizing, making it a great pick for guys with dry skin (does that mean James Bond has dry skin?). Floris No. 89 is a very fragrant aftershave, so you have to be careful which shaving cream you’re pairing it with (unless you’re using an unscented shaving cream, of course), and you typically don’t need to use cologne if this is your product. The scent combines strong orange notes with lavender and bergamot, and it finishes with faint spicy undertones of nutmeg and sandalwood. One of the defining characteristics of Floris No 89 is that the scent usually lasts all day, making it a great morning aftershave. 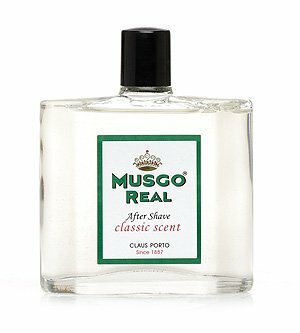 Musgo is a classic aftershave important from Portugal. It’s well-suited for normal skin. Musgo recently updated their formula to include aloe extract, which we really love. It has a noticeable soothing and calming effect on the skin – much different than aftershaves that kind of shock you with their coolness. The scent combines vetiver and patchouli, making for a decidedly masculine scent, which may not be for everyone. However, if used in moderation, you can get a great scent that lasts more or less all day. We recommend this aftershave for autumn mornings. Pair it with an unscented shaving cream and a very light floral cologne, if any. This is another mid-range aftershave. This is typically best for gentlemen with combination skin. It’s almost more of a lotion than a traditional aftershave, which is cool and watery. The color is milky, and it contains not alcohol at all, so if you hate that characteristic aftershave sting, this is a great alternative. The strength of this product lies in its restorative properties. It significantly reduces redness and irritation. However, it contains a lot of moisturizer, so it’s not the best aftershave for men with oily skin. 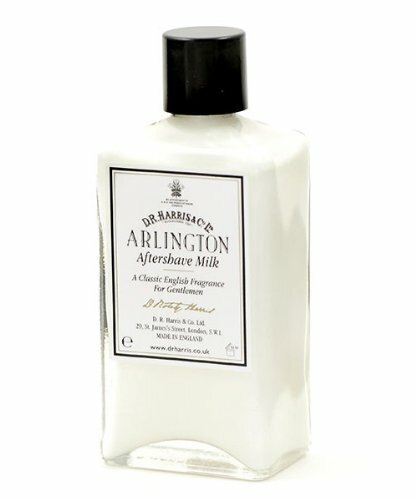 The Arlington scent is a classic English scent – masculine but not overpowering. We recommend D.R. Harris for the first winter months, when your skin needs a bit more attention than usual. At around $15, Lucky Tiger is an entry-level aftershave best suited for combination skin. It features an orangey, citrusy smell, which we found really nice. 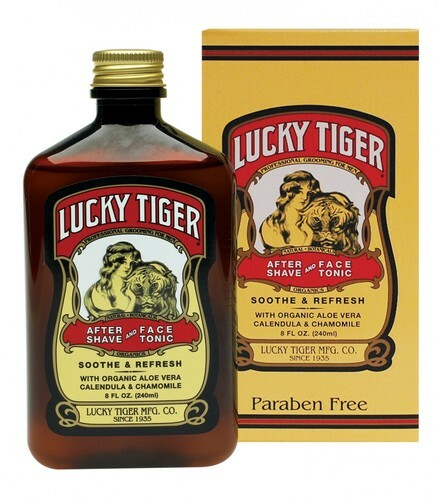 Unlike most aftershaves, however, Lucky Tiger’s scent is specifically designed to dissipate after a while. So the smell doesn’t last very long, but you can also have a lot more freedom to pair it with a stronger cologne. Additionally, it’s not designed to be a super-moisturizing aftershave, making it a good pick for lads with oily skin. One of the perks is that it’s made of all natural oils and ingredients, and because it doesn’t contain alcohol, it won’t burn your face. This is really flexible aftershave great springtime, when you don’t need lots of moisture or lots of cooling.